We are founders and organisers of the White Cross Sugar Beet Harvesting Syndicate. Our Homer Terrados T3 (pictures right) harvests over 800 hectares per annum. We also run a CTM9001s Sugar Beet Cleaner, complete with a JCB 416, which loads in excess of 100,000 tonnes of sugar beet annually. 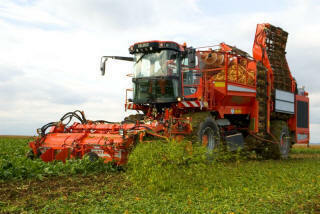 If you would like a quote for sugar beet harvesting or haulage, please contact us.